WASHINGTON — The number of people living on the streets, under bridges, in parks and in shelters in the D.C. region ebbed last year, continuing a multiyear drop in the number of homeless people in D.C., suburban Maryland and Northern Virginia. Overall, the number of homeless people in the D.C. area fell by 6 percent this year to 10,480 people, according to a one-night count conducted in January by outreach workers and compiled by the Metropolitan Washington Council of Governments in a report published Wednesday. Another positive trend: The number of formerly homeless people now living in some form of permanent housing increased by 14 percent to nearly 22,000 people across the region. In an interview with WTOP, Michael Ferrell, chair of the organization’s homeless services committee, called the decline “encouraging” and said it came thanks to a concerted effort in the region to provide permanent housing. But amid the overall decline in the region’s homeless population, the report also noted slight increases, for the first time in half a decade, in the number of homeless veterans and people described as chronically homeless in the D.C. region. The slight upturn recorded this year risks becoming a trend unless regional leaders confront “the stark reality about the lack of sufficient affordable housing,” the report concluded. The report tallied data on the homeless populations of nine jurisdictions. Along with D.C. and Alexandria, the areas included: Prince George’s, Montgomery and Frederick counties in Maryland, and Arlington, Fairfax, Prince William and Loudoun counties in Virginia. For every 1,000 people in the region, 1.9 are homeless, according to the report. D.C. has the largest share of the regions. For every 1,000 D.C. residents, 9.9 are homeless. Between 2017 and 2018, five of the nine areas surveyed reported decreases, based on the one-night count. In sheer numbers, the District saw the largest drop. 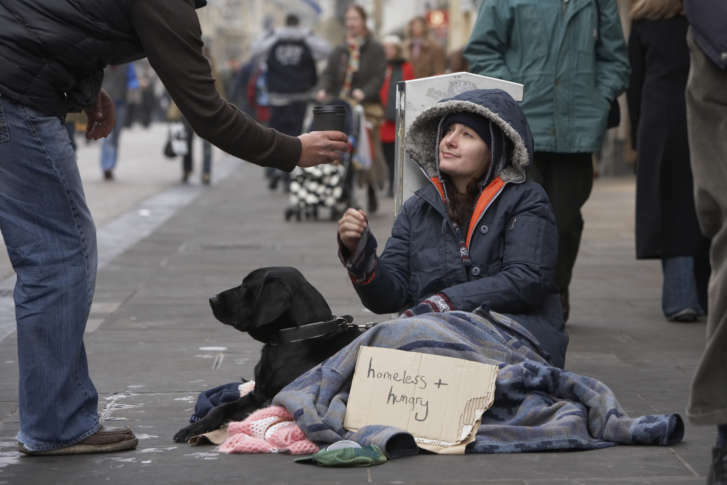 There were 569 fewer homeless people at the start of 2018 compared the year before, the report noted. That’s an 8 percent decline. The greatest percentage decrease came in Prince George’s County, where the number of homeless people fell by 10 percent between 2017 and 2018 — about 54 people. Frederick County in Maryland along with Alexandria, Fairfax and Loudoun counties in Virginia reported slight increases in the number of homeless people compared to 2017, according to the report. The longer-term trends are heading in even more positive directions, according to the report. Over the past four years, eight of the nine areas surveyed have reported declines in the number of people experiencing homelessness. D.C., which has the largest proportion of its residents experiencing homelessness, saw the largest declines in sheer numbers. 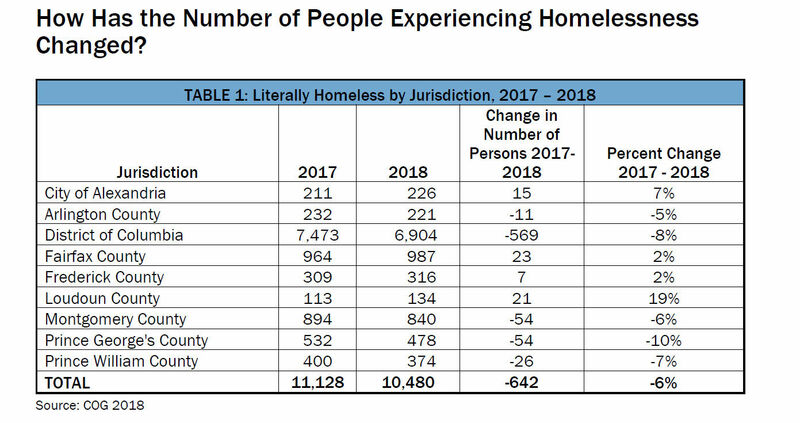 There were 844 fewer homeless people in D.C. in 2018 compared to 2014. In percentage terms, Prince George’s County saw the largest reduction — a 27 percent drop. Frederick County in Maryland was the only area that saw an increase in homeless people between 2014 and 2018. Based on the one-night count data, the number of homeless people in Frederick County increased by 28 percent — or 70 additional people. Stalled progress on veterans, chronically homeless? But the report noted what appears to be stalled progress in 2018 on reducing the number of homeless veterans. This year, the total number of homeless veterans increased 8 percent, according to the report. The uptick in the D.C. area may be part of a larger national trend, according to the report. The U.S. Department of Housing and Urban Development reported last year on the first increase nationwide in veteran homelessness in 2017 in seven years. Still, despite the one-year increase, overall the region has reduced veteran homelessness by 25 percent since 2014, the report noted. Similarly, while this year’s report shows a slight 2 percent increase in the number of people described as chronically homeless, the number has fallen over the last four years. The report called on regional leaders to continue to invest in programs that prevent homelessness, such as rapid-rehousing initiatives, which offer people help paying security deposits and making rent payments if they quality for federal assistance. “The single greatest barrier to ending homelessness in our communities is a limited and diminishing number of affordable and available permanent housing opportunities for the lowest income households,” the report concluded. The report authors said rising rents, a lack of affordable housing and stagnant wages are all challenges in the D.C. area.